Are you or someone you know having difficulty providing food for you and/or your family? 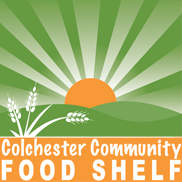 The Colchester Community Food Shelf (CCFS) provides free food to Colchester residents in need. Becoming a registered client of the CCFS is a quick and easy process! Please check the list of “Valid Documents” below to help speed up the registration process when you arrive at the food shelf. How often can clients shop at the food shelf? Registered clients can shop at the food shelf once a month. Clients typically leave with a little more than a week’s worth of food to supplement their household. What does a typical shopping list include? A typical shopping list might include fresh produce, milk, eggs, bread, a protein, such as ground beef, chicken thighs, hot dogs, etc., and non-perishables, such as pasta, pasta sauce, soup, tuna, cereal, peanut butter, jelly, juice, etc. What are the requirements to receive services? Any Colchester resident is eligible to receive help/services from the Colchester Community Food Shelf. Stop into the food shelf during our regular business hours to fill out a registration form. A volunteer at the CCFS will help you complete the registration form. Please bring valid proof of residency showing your name and current Colchester address. A list of valid documentation for proof of residency is available below. Where is the food shelf located? The Colchester Community Food Shelf is located in the old fire station in the village of Colchester. When is the food shelf open? Tuesdays: 11 a.m. to 1:30 p.m.
Wednesdays: 3:30 to 6 p.m.
Thursdays: 11 a.m. to 1:30 p.m.